The staff at Functional Advantage Physical Therapy works with a variety of people with different athletic and sport backgrounds to improve their overall performance and skill, and assist them with successful recovery when sports-related injuries do happen. It is our aim to keep you healthy and on the playing field. It is our goal to work with you, whether your particular sport is recreational or if you play in front of 20,000 screaming fans. At Functional Advantage Physical Therapy, we will work with you and help create a program that is related directly to the specialized needs of your sport. The staff at Functional Advantage Physical Therapy looks forward to helping you improve your performance, and we are excited to help you get better every day you play. Finally, please be advised that this area is designed to provide you with general information. 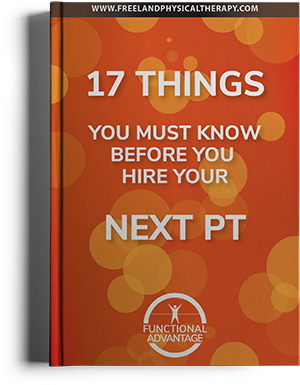 It is not our intent for you to diagnose or self treat yourself without proper guidance from a Functional Advantage Physical Therapy professional or a doctor. Do not diagnose, self treat, or attempt any exercises from the content on this site without contacting Functional Advantage Physical Therapy, your physician or a qualified specialist first. At Functional Advantage Physical Therapy we offer Physical Therapy and look forward to working with you to reach your goals in athletic performance.